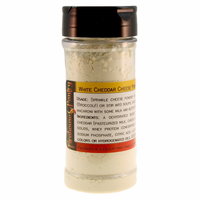 White cheese powder tastes great sprinkled onto popcorn and vegetables or added to soups and casseroles. 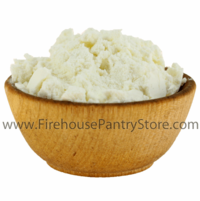 Use to flavor pastries and other baked goods, as well as rice, sauces, and snack foods. Whisk into cooked pasta with warm milk and butter for a perfect cheese sauce. The dry powder stores and travels well - no refrigeration required - great for emergency food supplies, camping, boating, and RVing. No artificial colors or flavors! Ingredients: A dehydrated blend of whey, cheddar cheese (pasteurized milk, cheese culture, salt, enzymes), whey protein concentrate, lactose, maltodextrin, salt, sodium phosphate, contains less than 2% of natural flavor (contains milk and celery seed oil) citric acid, lactic acid. Contains milk. Packaged in a facility that also packages wheat, milk, soy, egg, sesame, peanuts, and tree nuts. Frequently Asked Question: What is the shelf life of this product? Answer: The manufacturer lists a "Best By" date of 1 year from date of manufacturing, so once the product reaches you, it's about 10 months. However, we've found that if you store it in an airtight container, out of direct sunlight, and at room temperature or below, it easily lasts 2 to 3 years. Frequently Asked Question: Can you supply the nutritional data for this product? Answer: Yes. Click on a specific product below to view the nutritional information, located under the text "Product Description".